If you ever wanted to play the Vortigaunt from Half Life 2 now you can. 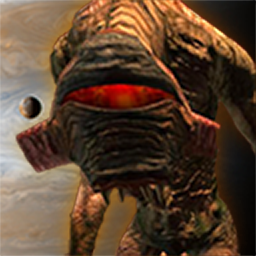 For v. 1.1, extract to "..My Documents\My Games\GalCiv2\Portraits". For v 1.2 beta I was able to use it by extracting to the new mods folder, in a subfolder named "Portraits". Have fun and please give feedback! Thanks. Hey, Zentiger. Could I use that vortigaunt image in a mod I'm making? With credit obviously. I should be posting a pack soon with Portraits and Logos. Sorry for the long delay..
HEY THIS LOOKS LIKE MY LAST BLIND DATE....................WHEN IS SAW HER I WENT BLIND!!!! FINALLY! It's about time someone made a half life portrait! Next, please make a DR.BREEN portrait with the combine insignia. Also, it would be cool to have the G-MAN in there too. PLZ make these it would be cool to have a halflife galaxy! Yeah! Now we can commnune with the Vortessence too.